Yesterday I had fuzzy memories of a poem I wrote in middle school. It was an English class assignment (of course) in which we had to show emotion in a poem. What I ended up writing was a poem about animals being jealous of Human beings laughing because animals cannot laugh. Now I know that hyenas laugh… we’ve all heard that, but I actually dug into this and started wondering: do any other living creatures have a sense of humor and experience comedy? I’m beginning to think that Comedy might actually be a large division between the animal kingdom and humanity. I can find evidence of artistry, song, play, language and community in animal lives. Some of these may not be natural examples (since I’m sure elephants only paint on canvas when given the materials), but all the same they seem to be teachable. Can any animal understand comedy? Then I realized that comedy itself is kind of odd. Why do we laugh at things that: rhyme, are uncomfortable, have two meanings, are taboo , don’t make sense, or even make sense but we never thought of it before. The more I thought about this the more I can wrapped up in how complex and mystical we are… and how big and mystical the universe is and how we think we know everything but really don’t understand anything at all. After a while that got uncomfortable so I watched some videos on youtube to reset. But I was still curious, so decided to go where all the answers are. I opened Google and typed “Why do we la” into the search box. The search engine read my mind and filled in the u-g-h at the end for me. Clearly someone else has googled this before. Once I moved past Yahoo, I hit Howstuffworks.com which does have an article explaining theories on laughter. ­I learned that: “Philosopher John Morreall believes that the first human laughter may have begun as a g­esture of shared relief at the passing of danger.” And that “Many researchers believe that the purpose of laughter is related to making and strengthening human connections” because laughter leads to human bonding. These theories are supported by the impressive statistic is that you are 30 times more likely to laugh in the presence of another person than when you are alone. How Stuff Works discusses 3 additional theories for why things are funny: incongruity theory (we laugh because the outcome was unexpected), Superiority Theory (we laugh because we feel better than other people), and Relief Theory (we laugh to relieve stress). The thing is … none of these has competely explained to me why I laugh when I see Tina Fey dancing. 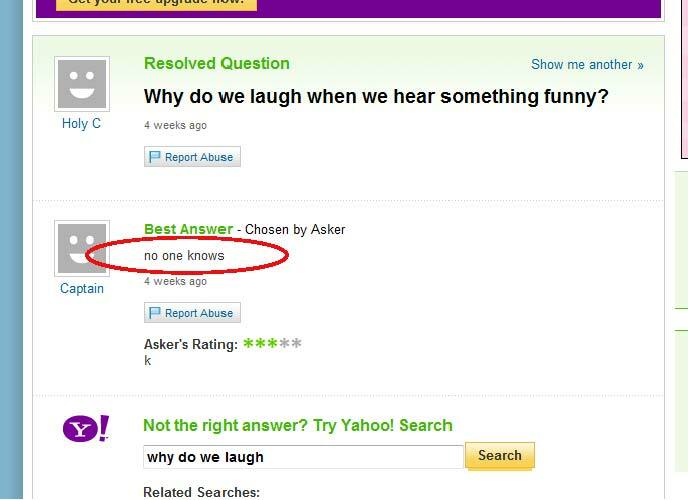 So in the end, yahoo Answers may have gotten it right.